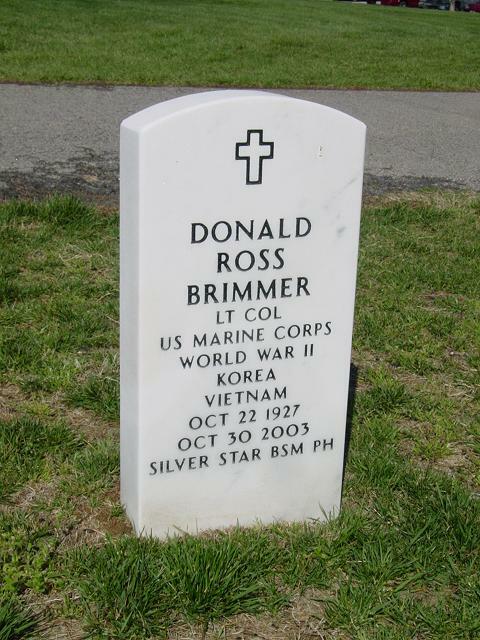 Donald R. Brimmer of Sterling, Virginia, passed away on October 30, 2003 after a long illness. He was a native of Rialto, California, where he lived until he entered the U.S. Marine Corps in 1945. In May, 1951, he earned the Silver Star Medal and Purple Heart while serving as a Platoon Commander in Korea. He was the recipient of the Vietnamese Gallantry Cross with Silver Star and the Bronze Star medal during the Vietnam Conflict. He retired as a Lieutenant Colonel with the Marine Corps after 22 years of service. After his retirement, he resided in Virginia where he recevied his BA and MA degrees in History from Old Dominion. He completed three years work towards a PhD degree in History from William and Mary in the 1970s. He is survived by his wife, Margaret; his brother, Lorne; his daughter, Karen, and son, Stephen and three granddaughters. Graveside services with Full Military Honors will be held on Monday, December 15, 2003, at 11 a.m. at Arlington National Cemetery. Friends wishing to attend should arrive at the Administration Building by 10:30 a.m. Donations to the American Cancer Society.